Archer M (1984). Evolution of arid Australia and its consequences for vertebrates. In Vertebrate Zoogeography and Evolution in Australasia. (Eds M Archer and G Clayton) pp. 97-108. Hesperian Press, Carlisle, WA. Archer M (1984). Effects of humans on the Australian vertebrate fauna. In Vertebrate Zoogeography and Evolution in Australasia. (Eds M Archer and G Clayton) pp. 151-61. Hesperian Press, Carlisle, WA. Archer M (1984). The Australian marsupial radiation. In Vertebrate Zoogeography and Evolution in Australasia. (Eds M Archer and G Clayton) pp. 661-6. Hesperian Press, Carlisle, WA. Archer M (1984). The status of Australian dasyurids, thylacinids and myrmecobiids. In Vertebrate Zoogeography and Evolution in Australasia. (Eds M Archer and G Clayton) pp. 1015-21. Hesperian Press, Carlisle, WA. Archer M and Clayton G (Eds) (1984). Vertebrate Zoogeography and Evolution in Australasia. Hesperian Press, Carlisle, WA. Archer M, Clayton G and Hand S (1984). A checklist of Australian fossil mammals. In Vertebrate Zoogeography and Evolution in Australasia. (Eds M Archer and G Clayton) p. 1041. Hesperian Press, Carlisle, WA. Archer M and Hand S (1984). Background to the search for Australia's oldest mammals. In Vertebrate Zoogeography and Evolution in Australasia. (Eds M Archer and G Clayton) pp. 517-66. Hesperian Press, Carlisle, WA. Bewick T (1811). History of Quadrupeds. 6th edn. Reprinted 1970. Ward Lock, London. Calaby J (1984). Changing the face of a continent. In Vertebrate Zoogeography and Evolution in Australasia. (Eds M Archer and G Clayton) pp. 1011-14. Hesperian Press, Carlisle, WA. Cooke BD (1998). Did introduced European rabbits Oryctolagus cuniculus (L.) displace common wombats Vombatus ursinus (Shaw) from part of their range of South Australia? In Wombats. (Eds RT Wells and PA Prid-more) pp. 262-70. Surrey Beatty and Sons, Chipping Norton. Flannery T (1984). Kangaroos: 15 million years of Australian bounders. In Vertebrate Zoogeography and Evolution in Australasia. (Eds M Archer and G Clayton) pp. 817-36. Hesperian Press, Carlisle, WA. Hornadge B (1972). 'If it moves shoot it...' Review Publications, Dubbo. Marshall AJ (1966). The Great Extermination. Heinemann, Melbourne. Murray PF (1998). Palaeontology and palaeobiology of wombats. In Wombats. (Eds RT Wells and PA Pridmore) pp. 1-33. Surrey Beatty and Sons, Chipping Norton. Quirk S and Archer M (1983). Prehistoric Animals of Australia. Australian Museum, Sydney. Rich T (1984). 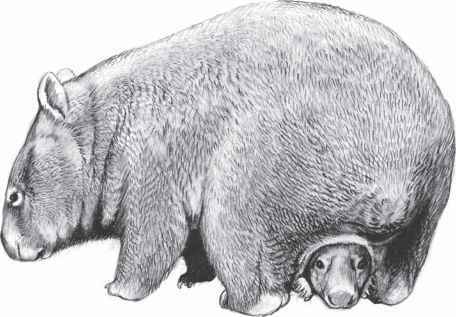 Australia's largest marsupial, Diprotodon: its ancestry, palaeobiology and extinction. In Vertebrate Zoogeography and Evolution in Australasia. (Eds M Archer and G Clayton) pp. 995-7. Hesperian Press, Carlisle, WA. Stephenson NG (1967). Phylogenetic trends and speciation among wombats. Australian Journal of Zoology 15, 873-80. Van Dyck S and Strahan R (Eds) (2008). The Mammals of Australia. 3rd Edn. Reed New Holland, Sydney.